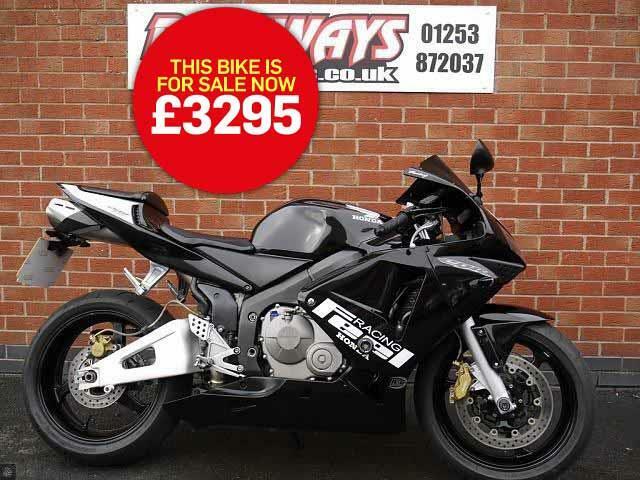 Today's bike of the day is the Honda CBR600RR. The RR first arrived in 2003 and is a track-based missile, designed solely for demolishing circuits with pin-point accuracy. The bike received some of its final major updates in 2009, before meeting its demise at the end of 2016. This included subtle tweaks to give better mid-range and a smoother power delivery, making it more usable on the road. Riding with incredible stability in a straight line and through the corners, there's fluid braking and suspension action and it is certain to deliver confidence and flatter the rider. With most of the torque produced between 6000rpm and 10,000rpm, the engine is flexible on the road without sacrificing any top-end power and loves to be revved. A world-first was also made with the optional electronically-controlled Combined ABS system, creating a beautifully built, high performance machine worth every penny. Sellers, Raceways Motorcycles, say: "For sale is this Honda CBR600RR on a 2003, 03 reg plate. This machine has done 20,442 miles and is finished in black with a tail tidy. "What's more, the bike comes fully serviced and is great value. This example is in very good condition and is available with three months warranty. Extras include R&G engine and front fork protection and LED indicators. Part exchange is welcome and UK delivery is available for £99." "A brilliant motorcycle with real power and excitement but with the added practicalities to make it a contender for just about anyone's garage"
"Practical, easy to ride, fairly swift, comfortable and thanks to ABS brakes as standard, safe, too"